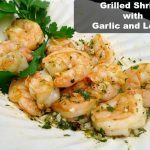 Shrimp is first marinated, threaded and air-dried in the refrigerator ensuring that the shrimp get a head start in browning on the grill. They stay juicy and full of flavor. No more rubbery shrimp! Combine baking soda, salt, and sugar in a medium bowl. Place shrimp in bowl and toss to coat. Thread the shrimp onto skewers, alternating heads to tails and pushing the shrimp so that they are nestled snugly together; you should have about 6 shrimp on each skewer. Lay skewers on top of a baking dish so that the shrimp are suspended above the bottom of the dish. Transfer to refrigerator and allow to rest for 1 hour. Meanwhile, combine half of garlic and half of olive oil in a small bowl. Combine remaining garlic, olive oil, lemon zest and juice, and parsley leaves in a large bowl. Set aside. When shrimp are ready to grill, brush both sides with garlic/oil mixture. Light gas grill and allow to preheat covered for 10 minutes or for charcoal grill until the coals are gray -- cover and allow it to preheat for 5 minutes. Be sure the grilling grates are clean and oiled. Place shrimp directly over the heat and cook, turning occasionally, until shrimp are just cooked through and charred, 4 to 5 minutes total. Take off the heat. Carefully remove the skewers from the shrimp and transfer to the bowl with garlic/oil/lemon mixture. Toss to coat. Season with salt and pepper to taste and serve immediately.